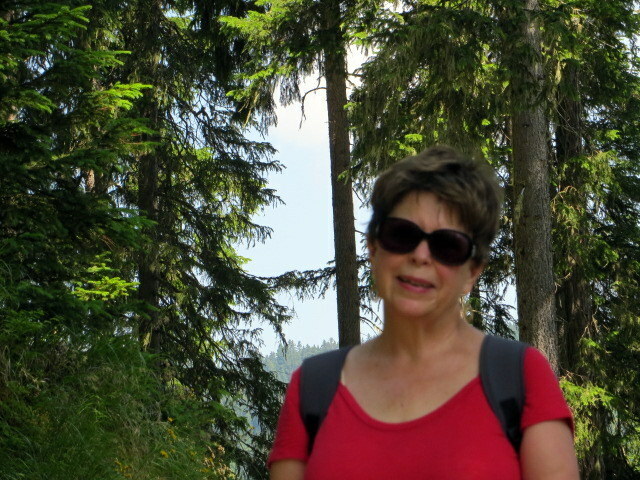 As I write this it is 82F/27C in Ortisei, in the Val Gardena, Italy. It’s not supposed to be that hot here! We came to cool off, expecting 70F/21C or so. I told Ric, “Try not to show how much I am sweating.” On the trail to Saltria. 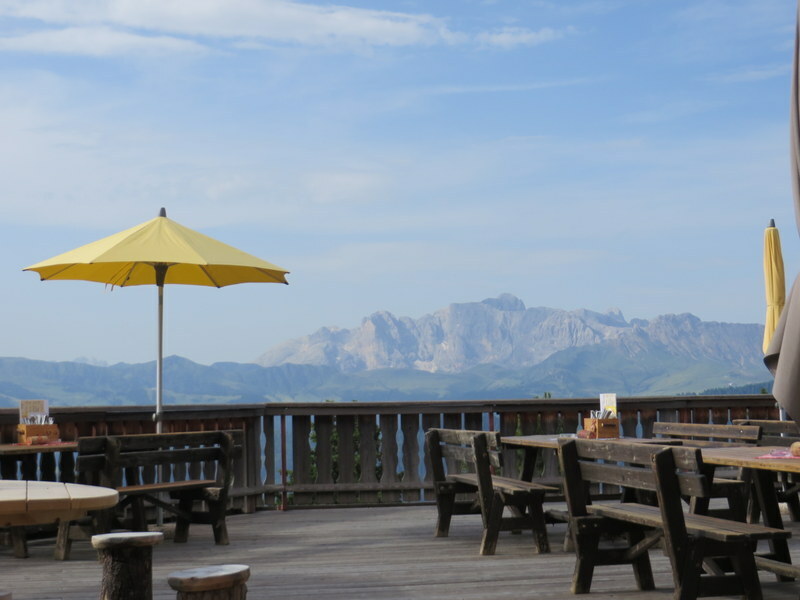 Heat haze building already at 09:00, looking across to the Alpe di Siusi from our pre-hike cappuccino stop. We can only hope this is an anomaly for Portland and the Val Gardena, that climate change isn’t going to ruin the summers. In 2012 when we “discovered” the Val Gardena and the Alpe di Siusi for ourselves, we started out one morning at a brisk 44F/7C. Heaven compared to Roma, which was having the hottest summer in over 200 years. Our 2013 trip required starting each day with at least a sweater to ward off the chill, while in 2014 that sweater was topped with a windbreaker and I gave thought to buying a fleece. 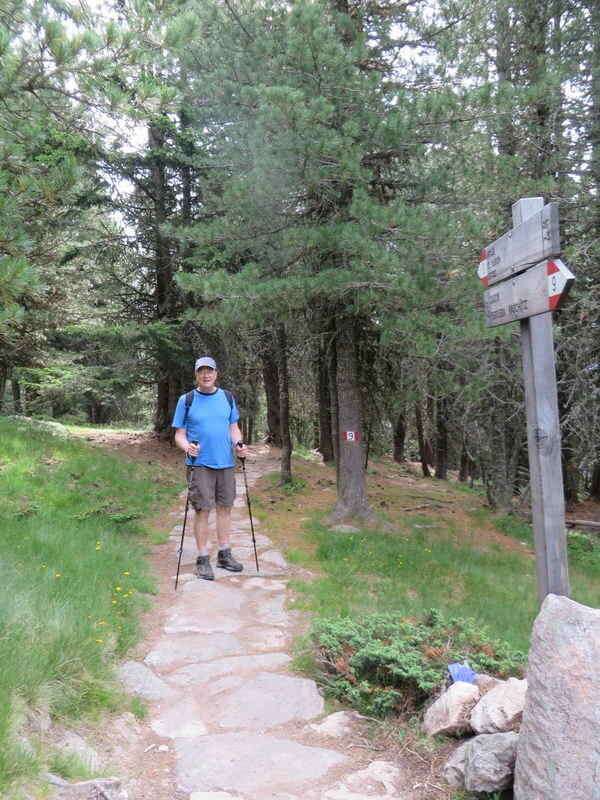 Ric on the trail Monday, walking down from Rasciesa, a quad-straining descent of 863 meters/2827 feet. Not so 2015. Still we are hiking, slathering on the sunscreen, gulping water, hugging tree-lined trails where possible. The nights are better, thank God, as air conditioning just does not exist in most lodgings, at least not in our price-range. In the next few days, Portland and Ortisei will cool off while Roma and the Alpe remain hot and Abu Dhabi returns to insufferable. On a more positive note, this is a big first for us in 31 years of traveling together: we are staying two full weeks in the same place! We’ve been on longer trips, moving around, but never two weeks in exactly the same town/apartment. Truly a vacation. Yeah yeah yeah, I can hear you now: “You’re retired; you need a job to be on vacation; blah blah blah.” All I can tell you is it is great and we have time. I do have to look at my pill minder to remind me of the day of the week. 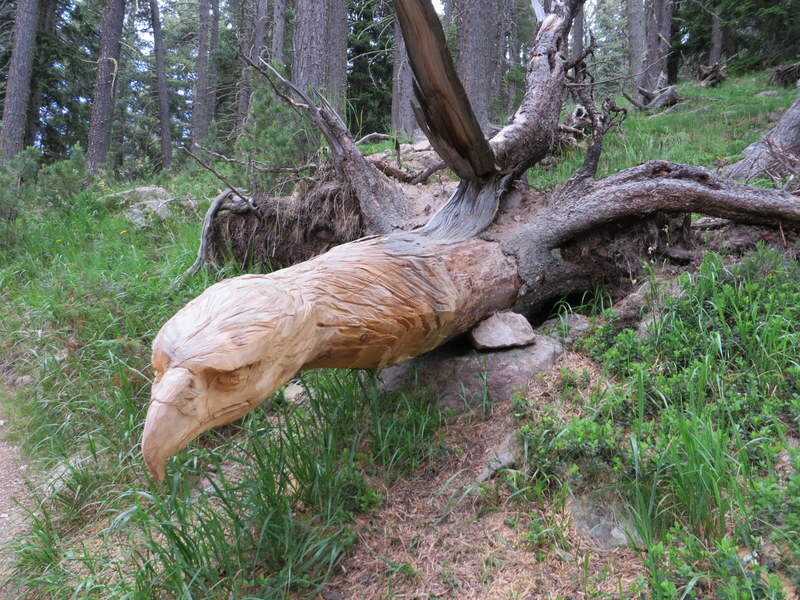 We happened upon this carving in the middle of the forest, unsigned, a gift from a local woodcarver. More posts to follow! Aufwiedersehn/Arrivederci/Assudëi from the land of many languages, German, Italian and Ladin. More on that in the future. I just can’t not fathom how many beautiful places there are to visit in Italy. Everyone post shows lovely hiking, food and comfortable lodging all set up for visitors but it these places also do not look crowded (like here!). Two weeks sounds fantastic! It is so nice to settle into a place, buy groceries, get to know the shops, and not feel rushed! The only thing better would be open-ended, but we have to get home to the cats and relieve the pet-sitter! It’s cooler in Seattle today. The breezes got the house cooled down to 71 this morning! Mine too! Just wish I had real cross ventilation then it wouldn’t be quite so bad. Most of the day was lovely but it has warmed into the 80’s this afternoon but should cool off for sleeping tonight. Finally! We will be in Portland next month! Praying it gets over this heatwave by then! But yes, hot in Italy is, at least, hot in Italy. When I read your first line I thought….she’s so lucky she not in Portland….in so many ways. Hot here in Seattle too but if I have to be hot I’d rather be in Italy! Lovely pictures as usual. And I can’t see your sweat!